We were in the area of Highgate London to fit some of our bespoke shutters to a newly renovated kitchen in this semidetached house. The room was a modern kitchen diner which boasted some great windows that allowed natural lighting into both sides of the room. 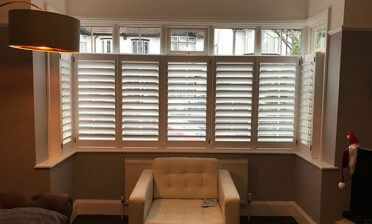 The customer was looking for some of our shutters to further enhance the look of the new renovation, while also having full control over the lighting and privacy throughout the day! 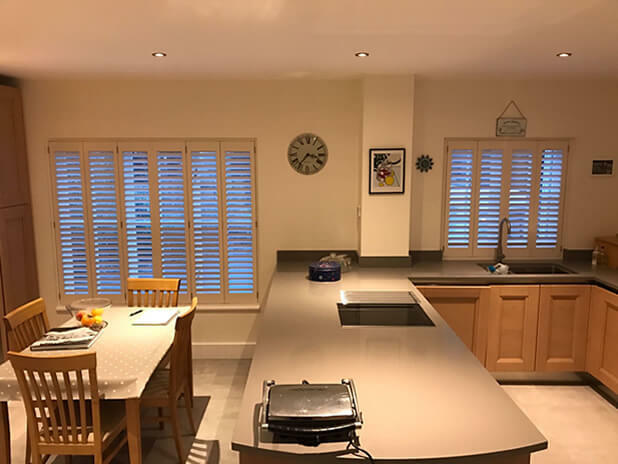 The client made a wise choice choosing shutters over curtains or blinds as they make for an impressive finish to the kitchen and can achieve the functionality he is looking for. Privacy was one of the issues we discussed with the client due to the neighbouring houses looking into the garden and kitchen windows. 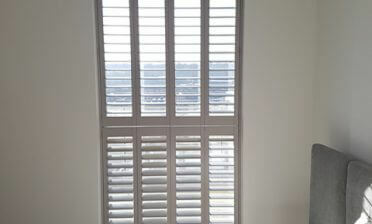 Using shutters is the only way of achieving levels of privacy whilst also allowing for maximum usage of natural light. As mentioned the other advantage of our Fiji Range is that they are naturally water resistant which allows for top quality hardwood shutters to be installed in areas that at some point may come into some contact with water or moisture such as above the sink in this case! Our fitting technicians Luke and Jimmy made great effort working behind the tight space behind the sink to avoid putting any unnecessary pressure on the work surfaces or damaging any of the brand new renovation. As with all our installs we take great care with all our customers properties and make sure to leave no mess behind, ensuring that the customer is happy with not only our workmanship and product, but every aspect of our service from start to finish. 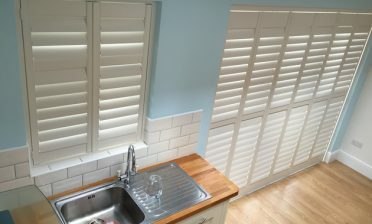 The shutters were finished in a lovely silk white while compliments the newly painted off white colour of the walls.